More about my music and collaborations. 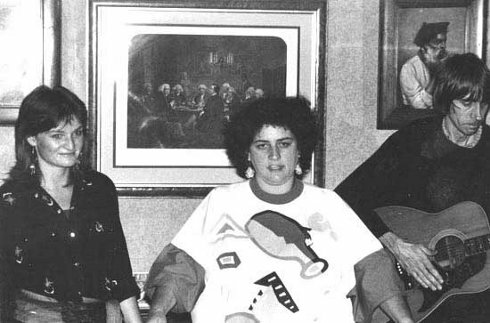 I was in a duo with Mina Sassoon in London. 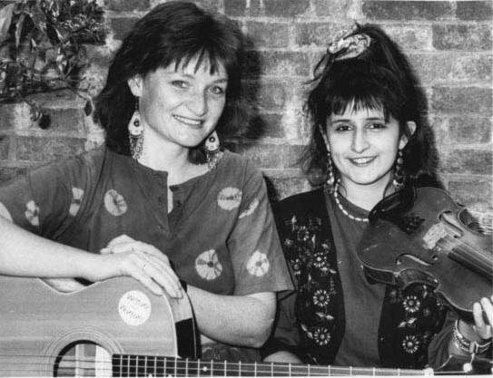 I was in a three-piece semi acoustic band called Fancy Footwork in London and I also played solo at acoustic clubs such as Bunjies, in the 1990’s till I left London in 2006. Fancy Footwork released a protest cassette with two tracks called "Oxleas Wood" and "White Violet Morning" written by band member John Arthur. Later it was decided that eight thousand year old Oxleas Wood would not be demolished to build a road. Paulines mum said "That was all because of your song". I performed at Loch Lomond folk festival in 2012 and supported Mary Kathleen Burke in the Maid of the Loch music sessions. 1991 – Cassette/CD called “Don’t Give Up” with ten tracks – still available. 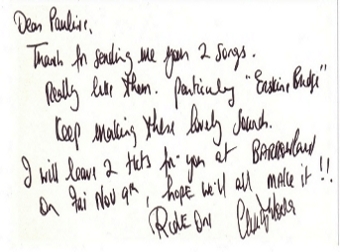 1997-1999 – CD with 4 tracks “From the Liverpool Dockers dispute”, also songbook – still available. 2005 – CD called “Refusing to Kill” with three tracks – still available. My "Don't Give up" recording received supportive words from Tony Benn!! Cover art from latest album “No Borders, No Barriers”. 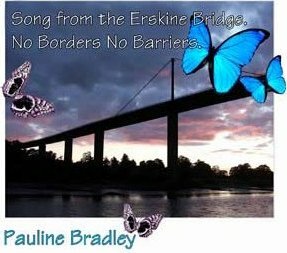 The Erskine Bridge situated about ten miles from Glasgow and near the towns of Erskine, Clydebank, Dumbarton, and the villages of Dalmuir, Old Kilpatrick and Bowling; is a spot of unrivalled beauty. It spans the river Clyde where big liners from across the Atlantic were seen making their way down stream. Dumbarton castle, the river Leven, Loch Lomond and the Trossachs National Park are nearby which attracts cyclists and tourists. Shipbuilding once employed hundreds of thousands of locals and historic struggles have taken place such as the Upper Clyde Shipbuilders "work in" in 1972 where Jimmy Reid made his famous speech. This attracted huge support and prevented the closure of the shipyard. 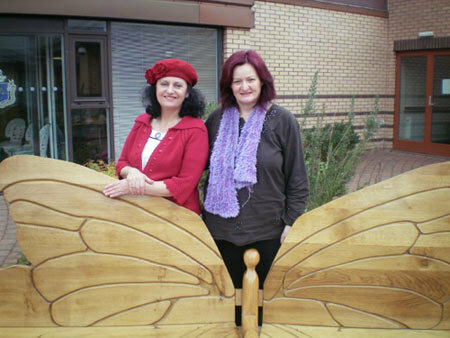 Anne Morgan and Pauline Bradley with the Butterfly Bench which now resides at St Margarets Hospice, Clydebank. It was made by Glasgow Recycling with monies raised from butterfly benefit gigs. The butterfly is used as a symbol of transformation as an alternative to suicide.